4 Reasons why reputation monitoring is important for Healthcare Industry? With computerized innovation continually building up, the healthcare service scenario is changing, creating modern consumer behaviour. The sudden hike in the innovation of portable or mobile phones and open healthcare gadgets give clients more control over the choices of their care like never before. 8 out of 10 people check online reviews or doctor’s feedback online before visiting any doctor or physician because those people are concerned about their patient’s health. Sometimes, people look for freelance doctors or health specialist and choose the right one according to their ratings and reviews available on the internet. So, people check your brand reputation on the internet before deciding to do business with you. Hospitals and clinics are huge businesses, and getting more and more patients in the door is the greatest priority and to make it work, your clinic needs to be more welcoming and trustworthy. At the end of the day, you need good and strong reputation over the internet. Reputation monitoring is important for the healthcare industry to check what is happening with their brand online Because people show more concern when it comes to the health of their dear ones, people check online reviews of all the alternatives and then choose the right one according to their presence on the internet. People believe the conversation trail on the review sites instead of business communication. So, it is necessary for hospitals and clinics to maintain their online reputation to seek more customers. To maintain reputation, reputation monitoring is important. Sometimes there are chances of occurrence of posting reviews which are actually not related to an actual event. It means either these reviews are fake or not depicting the actual scenario. There are chances that these types of reviews are posted by competitors or rival of your hospital. Reputation monitoring shows you the overall reviews and complaints about your brand which helps you to highlight the reviews and it gives you the basis to check the authenticity of reviews. Fake and reviews posted by rivals can damage your hospital’s brand reputation this is the reason why reputation monitoring is important because it helps to check the brand summary and be aware what is going on with your brand online. It is necessary to authenticate the reviews to ensure that the reviews are real or fake or made by rivals to damage your hospital’s reputation. 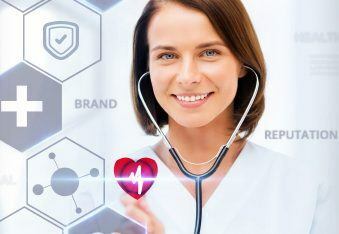 Reputation monitoring helps to know your brand’s value according to customer’s reaction and perception when it comes to your hospital or clinic. The propensity to engage your customers when it comes to your brand shows that how they feel about your brand, how much they are satisfied with your services, what their perceptions towards your brand are. So that necessary improvements can proceed. User ratings are the biggest example of your brand’s value and perception of your patients and their families. There are many software’s which depicts brand’s reputation but RankmeOnline is your Digital brand’s monitoring platform which will help you Providing actionable insights from customer opinions and interactions to brands, to know your reputation score, brand summary and competitive analysis which shows how your brand is working as compared to your competitors in every aspect. This will give you an idea that which things are going well and on which things you need to improve on?